Amanda Price adores all things bug-related—from spiders to mantises—like, seriously loves them. Unfortunately most of her fellow sixth-graders do not share her invertebrate obsession. They’re grossed out by it. Especially Amanda’s ex-best friend, Emily, who thinks Amanda is creepy weird. But when mysterious invaders menace the town of Oyster Cove and take both Amanda and Emily’s mothers captive, Amanda unexpectedly develops amazing insectile powers! Newly equipped with antennae and a glistening exoskeleton she uncovers a secret that changes everything. Now Amanda has to act fast or her town and her mom are doomed! There’s just one complication…she needs Emily’s help. Suddenly Amanda’s worst enemy becomes her best ally, but working together may be even harder than saving their town from being squashed like a . . . well . . .
BUG GIRL. She’s got the buzz. Benjamin Harper was born and raised in St. Petersburg, Florida where he spent his time obsessing over insects, dinosaurs, space travel, and kaiju attacks. He went to Warren Wilson College in the beautiful mountains of North Carolina and then moved to New York where he started working in children’s publishing. He’s been involved in children’s books ever since, as both an editor and author. Currently, he lives in Los Angeles, California where he works on super hero stories and lives with his cat Edith Bouvier Beale, III. Benjamin is the author of the Bug Girl series and Obsessed with Star Wars. Sarah Hines Stephens has been a children’s book reader, editor, seller, buyer, doctor, author, copyeditor, ghostwriter, and speaker for many years—and she is still most of those things. She makes her home in Oakland, California where she lives with her husband, two kids, and two dogs. When she is not doing book related things, Sarah enjoys cooking and eating and gardening and traveling. And she’s pretty good at them. Sarah is not a good dancer, but she does that anyway. 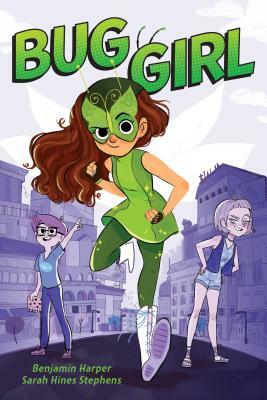 Sarah is the coauthor of the Bug Girl series, including Bug Girl: Fury on the Dance Floor. Anoosha Syed is a freelance illustrator and concept artist for animation. She is a graduate of Ceruleum; Ecole d'arts Visuels in Switzerland, and is currently living in Toronto. Select clients include Lacoste, Walmart, Simon & Schuster, Nickelodeon, with work also being featured on Buzzfeed and Nerdist. When Anoosha isn't drawing for work, she's drawing for fun (she doesn't really have any other hobbies). She is the illustrator of Bug Girl and Bug Girl: Fury on the Dance Floor.